See our stunning selection of Full Size futon covers with FREE Shipping Included! These quality covers come with 2 coordinating pillows in various patterns and themes to decorate your room. Change out your bedroom or living room decor quickly with these futon covers and pillows sets. There are quite a number of colors and special designs to choose from. Browse through our entire collection below and see which style best suits you! Futons are an excellent investment, because they not only provide extra seating, they provide an option for another sleeping area as well. Many times, a customer will invest in a really nice frame, either made of metal or wood, and will be disappointed that the mattress color is completely different than the scheme of the room that it will be placed in. Futon covers are a great way to accentuate your existing design, turning a boring futon mattress into a masterpiece. With many colors and patterns to choose from, it is simple to choose which full size futon cover with pillows will suit your style the best. When you purchase a slipcover with pillows, you are not only adding a touch of design to the piece of furniture itself, you are also adding accents to your room’s decor with soft throw pillow covers. If you make the investment of a futon cover, choosing the right accent pillows or pillow cases is essential to continue to the flow and feel of your room. We offer an excellent selection of both futon covers and pillows, ensuring that you will accentuate the ambiance of your room with style. Regardless if you are using the pillows as a decoration, or used for visiting guests who are spending the night, these covers will provide comfort and serenity with a simple zip. Full size futon mattresses measure 54" x 75" but you want to make sure that you have the correct dimensions before you make the investment into a cover. If you purchase more than one cover, you then have the option of changing the look of your room in just minutes. Futon covers will increase the longevity of your existing mattress because they are incredibly durable and will protect your furniture from accidental spills, pet hair, and tears. With almost three hundred styles including modern, floral, stripes and more, it is almost certain that you will find the perfect choice for your living room or bedroom. Any piece of furniture is an investment. 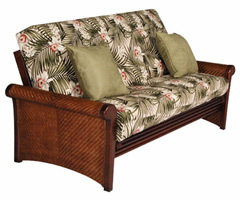 Choosing to protect your investment with a beautiful slipcover is an excellent idea. Most futon covers that you will find here will come with two throw pillows, ensuring that you will be able to accentuate your room’s design with perfection. These covers are easy to remove to spot clean, which is easier than trying to figure out how to wash a mattress. Whether you are looking for a solid color or an abstract print, we have exactly what you are looking for at a very reasonable price. All of our products are backed with a 100% customer satisfaction guarantee, and you can receive free shipping with your order. Take some time to measure your mattress to make sure that the cover will fit its dimensions, and look at the current design of your room to get an idea of what color or print that will accent it perfectly. Our selection of covers are a great way to turn an ordinary piece of furniture into a masterpiece of comfort.